FIFA World cup 2018 is on the verge and till now 7 teams has been qualified other Russia who is also the host of this tournament. Brazil, Iran, Japan, Mexico, Belgium, Korea Republic and Saudi Arabia are the other 7 teams qualified. The World Football body FIFA has started the ticket sales from Sept 14, 2017. 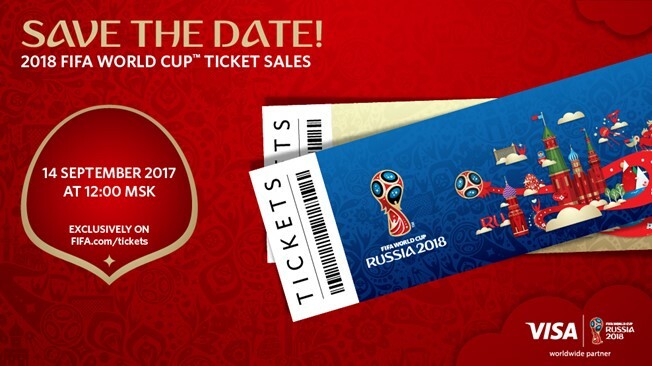 From Today itself people from all over the world can now book tickets for 2018 World Cup on FIFA.com/tickets. 1st phase will start from 14 Sept and ends on 12 Oct 2017 You can submit your ticket application to FIFA. You can submit you application on day 1 or on last day, its all equal. Tickets will be allocated randomly and the person will be notified by 16 Nov, 2017. Phase 1 Stage 1 will complete from 16 Nov to 28 Nov when tickets will be given on first come first serve basis. If you are not going to Russia, then watch world cup in your country on tv channel. Check all the details related to Fifa world cup 2018 tv channels. FIFA World cup 2018 Final Draw will be on 1 Dec, 2017 from there Sale Phase 2 will start. It will start from 5 Dec 2017 to 31st Jan 2018. 2nd Stage will start from 13 March 2018 to 3 April 2018 on first come first serve basis. Last Sales of tickets will be on first come first serve phase only 1 Stage. It will start from 18 April to 15 July 2018, the day when 2018 FIFA World Cup final will be played. Venue-specific ticket: include group matches except opening match to round of 16 and playoff match. Note: All the Fans going to Russia to watch 2018 World Cup Live on the ground need to apply for a FAN ID - which is the official document issued to fans.The FAN ID and a valid ticket are required for fans to be able to enter the 2018 FIFA World Cup stadiums. Please visit www.fan-id.ru to register FAN ID.